Price indicated is for set of 6 ports. 'Port Hole' like wine pegs. Wine bottles appear to float in the air by being held by neck end. 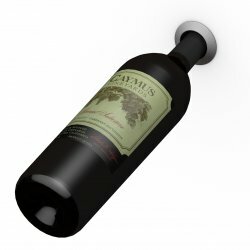 A unique wine storage solution. Rubber rings within the port hold the bottles secure. Available in Black, Chrome or Clear Acrylic. Custom panels are required and supplied by the customer. Minimum Horizontal and Vertical spaces are required between the ports is 5" to allow space for wine bottles. The port is installed in your custom panel (Between 3/4" - 1" thick) The bored holes are 1 13/16" diameter. The supplied O ring secures the port from the back of the panel. Once the ports are secured onto the panel then the panel gets mounted on the wall. This system works well with back lighting when using the clear acrylic ports. Shipping costs will vary depending on size of order and size of the back panels.